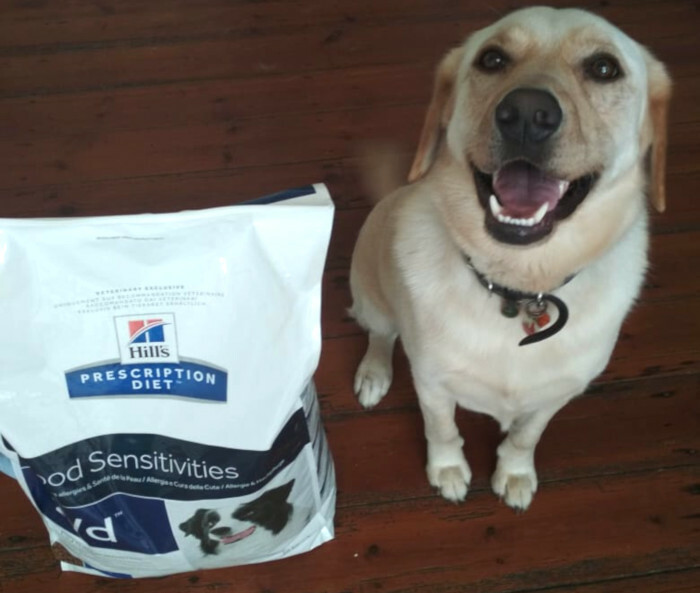 We review Hill's Prescription Diet z/d dog food. “Get a dog”; they said. “It will be fun,” they said. Listen, getting a dog is all fun and games until said dog starts to lick his paws with the incessant dedication of a toddler being handed a rapidly melting soft serve ice cream on a windy summer’s day. We adopted Sully the labrador from a shelter in April last year and for 3 months we lived in bliss with this shockingly well-mannered dog who never seemed to put a paw wrong. He was house trained, slept in his own bed downstairs with no prompting, and never tried to take naps on the couch. We couldn’t believe our luck. And then, the paw licking started, followed by the non-stop aggressive scratching. At first, we chalked it up to typical ‘dog stuff’ but when we started noticing nasty raw patches of skin on his paws and behind his ears (he kicked himself that hard! ), we knew it was time to act. I was also so done with the daily ritual of yelling at him to “pleeeeeease stop licking his paws!”. Much to my surprise, our vet revealed it was highly likely that Sully had a food allergy and that his itchiness (and paw licking) was being caused by the sub-par grocery store food we had been feeding him. Food allergy — two words that instantly revealed our precious fur-ball was more ‘pampered private school kid’ than ‘low-maintenance shelter dog’. The solution? A fancy-pants Hill’s prescription diet designed to treat his itchy skin at the source. 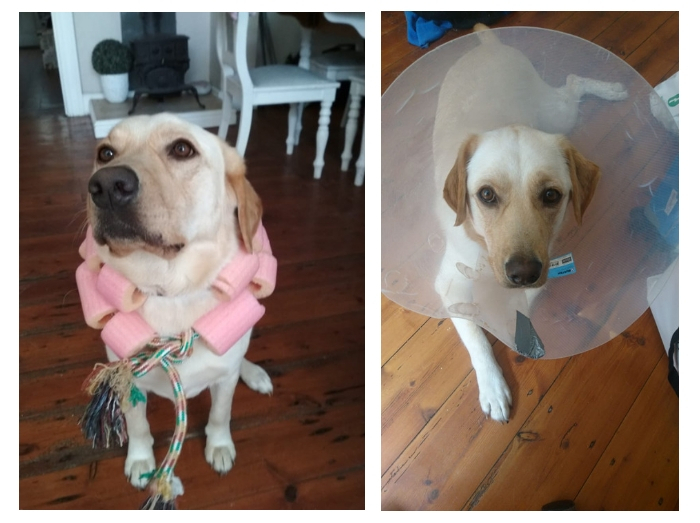 Sully wearing a home-made anti-ear kicking device & a cone of shame. Our vet prescribed Hill’s Prescription Diet z/d food and a few days in the cone of shame to help Sully’s skin heal and protect him from himself while his anti inflammatory medication kicked in. 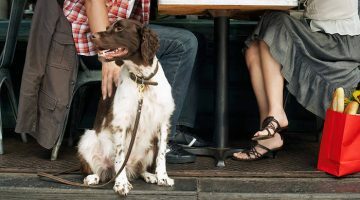 According to the Hill’s website, this hypo-allergenic prescription diet for dogs who display allergic reactions to certain foods, is clinically proven to treat adverse food reactions in dogs and improve their skin, coat, and gastrointestinal signs in 30 days. Hill’s says the crunchy pellet food has been carefully crafted with highly hydrolysed animal protein and a single purified carbohydrate source and in addition to improving the condition of your dog’s coat, it will also help improve stool. After a week of watching him sulk in his cone and two weeks on Hill’s z/d, we already started to see improvement in his behaviour and his coat was starting to look really fluffy and healthy. He was still licking his paw, but nowhere nearly as frequently, and he was being a lot gentler when scratching behind his ears. And the best bit? For me at least, was that Sully really seemed to be enjoying his new food. Listen, he’s a labrador, so food is everything to him, but the change in his excitement level around breakfast and dinner time when we switched to Hill’s food was noticeable. He started to drool when he saw us dishing up his Hill’s food, which he never did before (the vet suspects this is because the old food probably tasted a lot like cardboard… sorry Sully!). 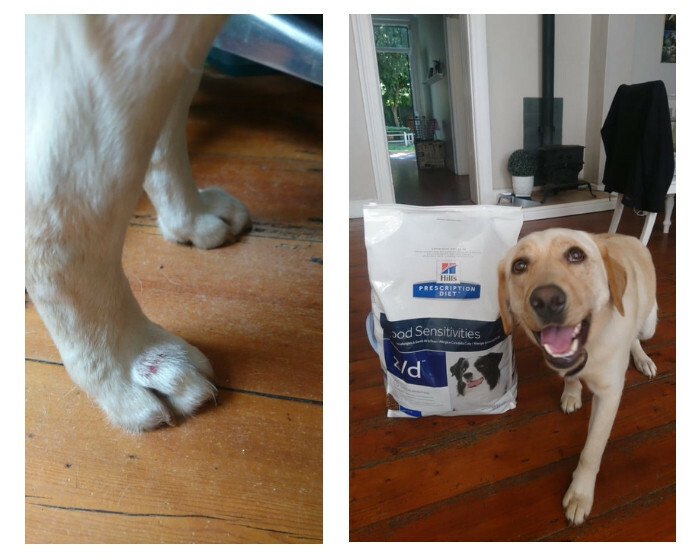 Sully’s paws before and him posing with his beloved Hill’s 2-months into his treatment. Now, 3-months later, Sully’s coat is looking better than ever before. And, instead of constantly yelling at him to stop licking his paws, we’re telling him how great his coat looks (because, you know, every dog needs a good complement every now and then). His paws have healed completely and while his still licks his one back paw every so often, he no longer licks it until it’s raw and painful. I’m also thrilled to reveal that his aggressive ear kicking has regressed to a normal dog scratch and his ears have healed completely. It’s truly amazing how much of a difference the Hill’s food has made to the look and condition of Sully’s coat, he’s like a new dog and is really living up to his pure bred labrador name. And, because I know you’re curious, yes his stool had indeed improved, and he’s a lot more regular than he used to be. As a bonus, putting Sully on Hill’s has really helped save my sanity and I feel like our bond has really strengthened now that I’m no longer scolding him about his paw licking all day every day. 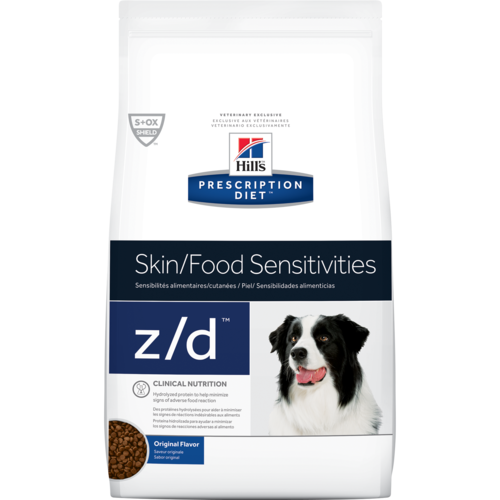 If your dog is struggling with a mystery skin condition or an insatiable urge to scratch and lick, then I would highly recommend asking your vet about Hill’s Prescription Diet z/d. Hill’s has a wide range of prescription diet foods available to treat dogs with a variety of conditions including weight management, skin allergies, digestive care, kidney care, and urinary care. You can find out more here. 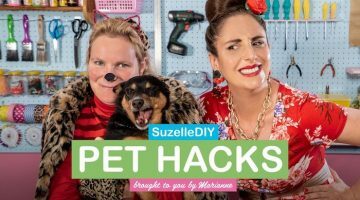 Want more pet-related reads? Check out our Pet section for more news, features, and reviews for pet owners.